Geographic Indication also known as GI identifies a product as originating in a particular region, where a given quality, reputation or other characteristics of the product is essentially attributed to its geographical origin. Promote goods bearing GI in the export market. GI may be associated with natural, agricultural, manufactured or industrial products. Geographical Indications can be registered at the “Geographical Indications Registry” established by the Government of India at Chennai. Process for registration is illustrated in the diagram. Often, producers maintaining the quality of product are exposed to unfair competition by individuals who sell lower quality of products at the same price. Geographic Indication assures producers’ credit, trust, and competitiveness in the market. It is a tool that intends to help rural areas in improving their livelihood.Geographic Indications can be used in the domestic and international market as part of the product’s marketing strategy. It is seen as an action to evade unfair competition. However, many of the Indian producers are not completely aware of the benefits of GI. Due to the lack of interest in Intellectual Rights in general, the number of applications for GI registration are low. Another reason could be that producer associations are not very well informed and networked. Frank and open communication channels are essential between various entities such as producers, cooperatives, associations, organisations, government representatives and the community in the Geographical Region. 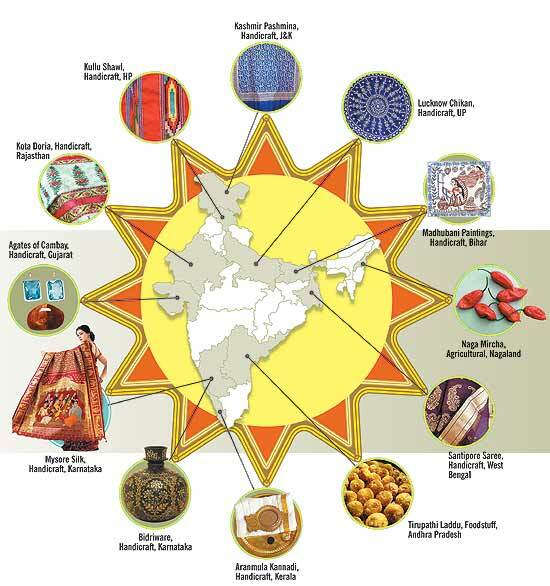 A list of Geographic Indications in India can be found here. The bamboo species Melocanna baccifera grows over a large area of Northeast India, primarily in the states of Mizoram and Manipur. It blooms approximately every 48 years, resulting in a human tragedy coinciding with the flowering of this species. Bamboo blossoms produce a fruit packed with protein and other nutrients. Rats feed on the fruits and seeds, and their population increases. After the supply of bamboo seeds and fruits are exhausted, the rats turn to human food sources – invade farms and villages devouring all the crops, and food stored in granaries, resulting in famine. Historically, this phenomenon has lasted for about 3 years, till the rats run out of food. It costs the lives and livelihood of thousands of people. The locals call it ‘Mautam’ or ‘Bamboo death’. Recently it occurred between 2005 and 2007. The Government set up a committee to address all possible issues relating to the imminent bamboo flowering or ‘Mautam’ including, but not limited to destruction of crops, epidemiological imbalance leading to increased risk of infection or outbreak of rodent borne-diseases. An action plan earmarked by a Rs 566 crore budget was initiated by the Government of Mizoram to face the threat and provide relief to affected communities. Called the Bamboo Flowering & Famine Combat Scheme (BAFFACOS), the action plan spread across 14 government departments such as food and civil supplies, agriculture, transport, health and horticulture. Departments using the BAFFACOS fund diverted and misused the allocations to the tune of Rs 23.08 crore by using it for some other purposes having no link with combating the rodent menace and mitigating the sufferings of farmers in the state. The poor extraction of bamboo resulted in the loss of Rs 226 crore to the state exchequer. The state environment and forests department neither took any effort to regenerate bamboo in the affected areas nor took any action to raise the plantations of new species having different flowering cycles to avoid negative effects of flowering. As a result, rodents continued to damage vegetables, fruit and rice cultivation in low-lying areas to the tune of almost 82.88 per cent of cropping areas in the state. Hunger claimed the lives of numerous people. Complete text of the BAFFACOS plan can be found here. Complete report of the Comptroller and Audit General (CAG) of India can be found on the link below.